I'm a huge fan of Amy Butler's work. Her designs are always fresh and beautiful, and I especially love her fabrics. 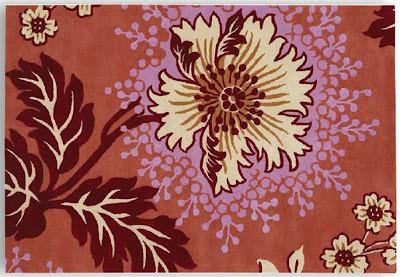 I just discovered that she's recently designed a line of area rugs for Chandra. Here's what Amy has to say about the her latest venture, "these rugs are truly handmade (I've seen it!). From the hand-tufting & dying of the 100% New Zealand wool, to the hand-carving of the designs by masters using special scissors. 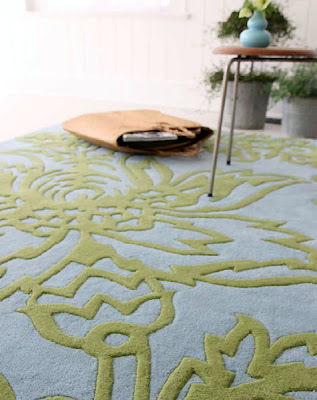 There are 19 rugs in the collection - 13 designs, six of which are colored in two colorways. They are all based on my fabrics and bedding prints!" I've put together a collection of my favorites - enjoy! Click here to view the entire collection. Have a wonderful weekend! I'm with you. I love Amy Butler's fabrics. The rugs are gorgeous! love them! i love the somewhat dizzying pattern they create, forcing your eye to move about, all around the rug and then...even more fun is how the rug and those patterns interact with the furniture they come in contact with. is that too deep for rugs? :) just how i see them, they are beautiful!! happy weekend julie! OMG these are awesome! I don't think I can pick just one! love! you always spot such great products. Love your new store. I'm surprised it took this long for someone to have this idea given how (deservedly) popular her prints are.